Today, it's easier than ever to do that yourself: Techniques developed by professional detailers have trickled down to passionate car enthusiasts. Your vehicle needs care both inside and out. The dash, rugs, carpet, handles, and headliner deserve as much attention as the hood, roof, wheels, and tires. Don't rush the cleaning process because you've ran out of quarters at the local wash or you didn't give yourself enough time. Start with the interior or exterior and then follow up the next day or weekend with the section you missed. 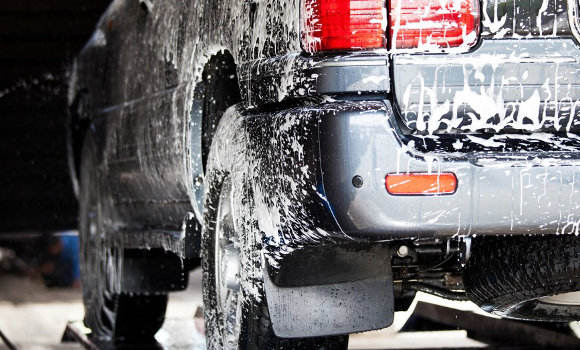 By being diligent about cleaning you'll have a vehicle that looks better and you'll keep it clean. The first step, we advises, is to fire up the air compressor and blow dirt from the nooks and crannies of your car's floor onto the middle of the carpet, where you can easily vacuum it up. Stiff brushes also loosen dirt from the carpets and upholstery. If you've got leather seats, use a conditioner with aloe. Pros use specially mixed acid solutions to clean dirty tires and to strip residue from new tires, as well as to get stubborn brake dust off wheels. Acid-based cleaners can cause bare alloy wheels to oxidize and pit, and they can damage wheels painted with color or clear coatings. "We recommend hand washing," says Mike Pennington, director of training at auto-surface-products giant Meguiar's. "Our customers enjoy doing it. It's not a chore." Hand washing gives you a chance to experience the tactile shape of your baby, and it's also a great way to inspect and familiarize yourself with the car's surfaces. There are two ways to clean contaminants, as well as stained and scratched old wax, off your paint: chemically or physically (though Pennington says it usually requires a combination of the two). Paint cleaners are liquids that remove wax, and also clean the top layer of the paint by removing unwanted environmental chemicals that have bonded to the paint. Cleaners can also remove small scratches called swirl marks from the paint. The purpose of polish is to smooth the surface of the paint, which will make it shine and help your car look newer. When you polish your paint, you can use an oscillating polishing machine. The pros use a rotating polishing machine, which works faster but will harm the paint if you're not careful. For DIYers new to detailing, oscillating buffers are more forgiving. Your car had a new clear coat when it left the factory, but that coat wears off over time and leaves the paint to fend for itself against the elements. That's where wax comes in. Wax is sacrificial and will wear off over the course of a few months, but in that time it will absorb stains and small scratches before those hazards make it to the paint. We're told older folks prefer paste wax, while younger ones like liquids. The choice is simply personal preference—both products do the job equally well. Finally, the pro detailers usually use two coats of wax; the purpose of the second coat is to cover areas that the first might have missed. Just don't waste your time trying to apply additional coats for added protection. They don't adhere and will be wiped off with buffing. Between paint cleanings and wax applications, you'll find you've picked up stains and scratches. Using liquid spray wax that can touch up these spots between waxings is a good idea but not a substitute for a real wax coating. Because there is no definitive way to tell when wax has worn off, stick to a schedule: Give your car a wax job every season if the vehicle spends every day outdoors.